When you update, install, or remove a component such as theme, patches, plugins,… on your Magento or Magento 2 website, you might encounter the error “Magento 500 Internal Server Errors”. The error is also likely to occur after you performing Magento upgrade, or after install Magento, or after system backup, on product page, on admin login. In this article, all the possible causes and solutions to fix this error will be listed for you. Before doing anything, you first have to Enable Developer Mode. It is “Developer mode” that allows you to debug Magento, which means it allows you to see detail exceptions on your error page, not just messages like “There has been an error processing your request”, “Magento exception printing is disabled by default for security reasons”, or “Magento 500 Internal Server Error”. Now the error is displayed, we need some solution to fix this error. Let’s fix the error for your Magento website. 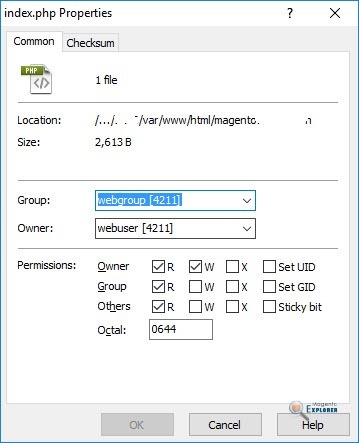 You should also change permission of another index.php file located in downloader/index.php to 644, otherwise you will see 500 internal server error when navigating to System > Magento Connect > Magento Connect Manager. Sometimes, you might see the error in a specific page of your Magento site like checkout page, product page, this may be because your server are lacking of resource to run Magento. For a store with around 500 products, it’s recommended to have at least 256M for php_memory_limit value. You can this value via .htaccess file or php.ini file. Due to the lack of permission on hosting, you might not change it yourself so ask your hosting provider, or you can pick a hosting from this list of best optimized Magento hosting to avoid lack of resource. In some situations, the error might be caused by wrong settings in .htaccess file, for example: wrong url rewrite/redirect setting. 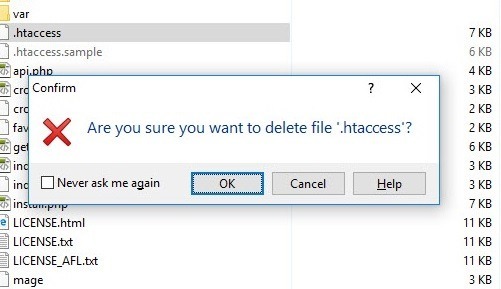 If that is the case, you can try renaming/removing .htaccess file to check if the error is fixed. Maintenance mode in Magento can be enabled by putting maintenance.flag file in Magento root folder (learn more). The maintenance mode also changes file permission of index.php to 666, which makes it unable to executed by web browsers. Next, change permission for index.php to 755 and clear cache to see if the error is still there. Next, restart httpd to apply changes. Then, check again if the error is fixed.